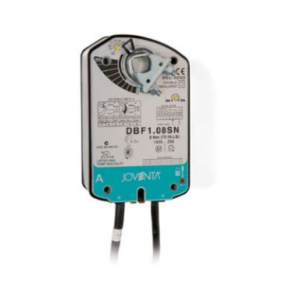 The JOVENTA SPRING RETURN electric damperactuator series has been specially developed for the motorized operation of air dampers in air conditioning systems. When the control signal is applied the actuator drives the damper to the operational position, while evenly tensioning the integrated spring. After a power failure the stored energy in the spring immediately brings the damper to the safety position. Manual operation is automatically cancelled when the actuator is in electrical operation. The compact design and universal adapter fitted with limitation of rotation angle make this actuator highly versatile. DAF1.08N 8 Nm 24 V 2 Point open/close Motor ca. 60 sec. DAF1.08SN 8 Nm 24 V 2 Point open/close Motor ca. 60 sec. DBF1.08N 8 Nm 24 V 2 and 3 Point open/close Motor ca. 60 sec. DBF1.08SN 8 Nm 24 V 2 and 3 Point open/close Motor ca. 60 sec. 20mA Motor ca. 60 sec. DAF2.08N 8 Nm 230 V 2 Point open/close Motor ca. 60 sec. DAF2.08SN 8 Nm 230 V 2 Point open/close Motor ca. 60 sec. 20mA Motor ca. 90 sec. DBF1.20S 20 Nm 24 V 2 and 3 Point open/close Motor ca. 150 sec. 20mA Motor ca. 150 sec.